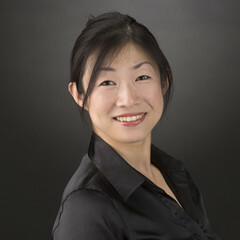 Born in Tokyo, Keiko Iwabuchi graduated from the Piano Course of the Tamagawa University College of Arts with the highest distinction. She received her undergraduate degree from the Conservatorio di Musica "Giuseppe Verdi" di Milano, and then became the first Japanese pianist to receive a master's degree as a korrepetitor (collaborative pianist) from said conservatory. She further studied at the Opera Studio of the Teatro Comunale di Bologna, completing their Korrepetitor Course. In the Studio she worked as an accompanist with distinguished conductors and singers in master classes and concerts, and served as an assistant pianist in operas including "Carmen," "L'elisir d'amore," "Idomeneo," and "Salome." She also served as an official accompanist at the "Giannino Zecca" International Competition for Opera Singers in Italy, and served as a korrepetitor at the historical Martina Franca Opera Festival. She then moved to Germany and served as a korrepetitor at the Semperoper Dresden for 3 seasons. Her teachers for korrepetitor studies include U. Finazzi, V. Taramelli and E. Pessen. In 2011, she received the Gotoh Memorial Foundation Cultural Award in its Opera Division. She currently teaches at the New National Theatre Opera Studio, Tokyo as a korrepetitor. This is her first appearance at PMF.